Reflecting on July 4th: Are we declining our independence? Being independent can be defined as not being influenced or controlled by others in matters of opinion or conduct. Stated another way, being independent is thinking or acting for oneself. But if thinking for oneself is the acid test of independence, it is fair to ask: Are we, as a society, surrendering our independence by abandoning critical thinking? Independence is not a passive endeavor. It is not granted or achieved in perpetuity. On the contrary, history is replete with stories of independence won and lost. Winners and losers, both as individuals and nations, are literally defined by their ability to maintain, and ultimately retain, their independence. When viewed through this lens, it is easy to comprehend independence for what it is: a perishable privilege. It should come as no surprise that the privilege of independence comes with corresponding responsibilities, responsibilities that, if ignored, could over time result in an erosion and even loss of independence. Fundamental to these responsibilities is the active participation in thoughtful and respectful discussion of important issues. To perform these acts of independence responsibly, we must be both informed and open-minded. It is here that I think we are failing, and it is easy to understand why we are falling short. But understanding why this is occurring will not change the outcome unless we each take proactive steps to correct the action. The first of these steps is a return to the fundamental act of critical thinking. The fact is that the thoughtful and respectful discussions I referenced earlier cannot occur without a discerning approach to the information we take in and share. It is certainly understandable how our ability to discern quality information became so corrupted. Not long ago, we had to seek out information, news and opinion – now it seeks us. Not long ago, content was expensive to produce and distribute – now a mobile device gives people access to the world. Not long ago, we could identify the source of the information and hold them accountable – now anonymity is prevalent. Not long ago, our opinions and beliefs were largely our own – now the analytics they generate are mined, processed and sold. Today the quantity of news and opinions directed at us is bewildering! Early on we did our best to be responsible and stay informed. But it is impossible to manage what has become an infinite stream of content vying for our attention. In response, we attempted to adapt first by skimming articles, then by just reading headlines and assuming the author’s intent, and, worse, assuming the credibility of the source. Social media, news apps and their associated user analytics have exacerbated the challenge of discerning fact from fiction. In our effort to stay engaged with our community of friends and associates we shared, liked, posted and commented, lacking the awareness and understanding that our every action was being tracked and analyzed. Oblivious to the fact that this tracking would ultimately result in a self-affirming stream of content that would make us feel more certain about our opinions/beliefs and those of likeminded groups while negatively impacting our worldview. It is time to correct our actions. The fact is we have fallen through the looking glass and now find ourselves in a world that functions very differently than it did just 10 years ago. While technology has changed, our biology has not. We are still only capable of consuming a finite amount of information, and therefore we have a responsibility to choose both wisely and with diversity of source. But how do we know the source of the content we are consuming is legitimate? Google it, of course! Not so fast; “We’re not a truth engine.” These were the words of Danny Sullivan, who in a CNBC interview is described as Google’s search liaison. It makes sense if you pause to think about it: Google’s algorithms report what is popular and paid for, not what is true. 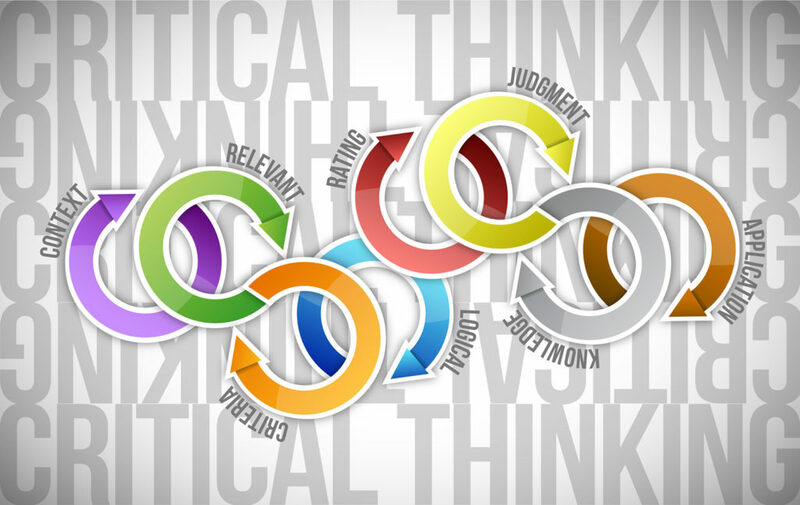 Critical thinking is the objective analysis of facts to form a judgement. Being objective in our thinking requires effort. Validating something you heard or read before sharing it requires effort. Taking in information with which we may not agree with an open and empathetic mindset requires effort. Critical thinking requires effort… but then so does independence. It is time to be skeptical. It is a time to engage. To fail to do so will be the declination of our independence.